Services Lessons, therapy, and more! Ride On leads the way. 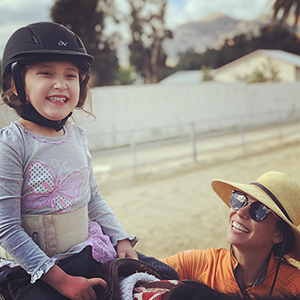 Ride On teaches adaptive horseback riding to children and adults with physical and cognitive disabilities and we provide physical and occupational therapy specializing in using the movement of the horse to improve specific medical conditions. 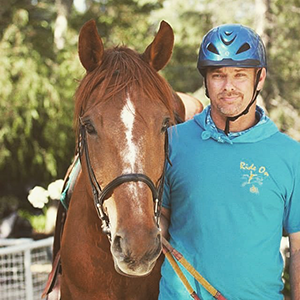 Ride On has given over 114,000 safe, effective and individualized lessons and therapy treatments and currently serves 225 individuals each week. Below is more information about the services that we offer. Adaptive or therapeutic riding is a unique combination of sport, recreation and education. Specially trained PATH certified instructors use their knowledge of disabilities to teach horsemanship skills to riders with varying ability levels. A typical lesson involves safety on and around horses, warm up exercises, games and riding skills including equitation and obstacle. Increased strength, balance and self-esteem are some of the benefits of this wonderful recreational activity. All riders wear an ASTM-SEI approved helmet and use standard English or western tack or equipment specially adapted to their needs. Riders should wear long pants and closed toe shoes or boots. Lessons are charged by the session and are 8 weeks long. 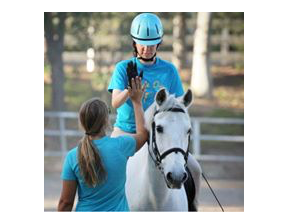 Our staff will evaluate students and their goals and ability will determine the length of the riding lesson. Lessons are $52 for a ½ hour private or a 1-hour group lesson (3 or more riders). 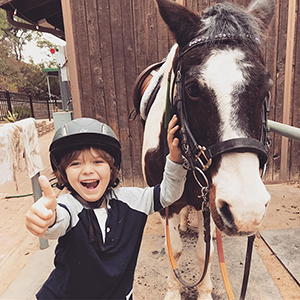 The minimum recommended age for adaptive riding is 4 years old however we do have programs for younger children. Scholarships are available for those in financial need. Please call for more information. Hippotherapy is one of several treatment strategies that a therapist can use as part of a treatment plan. Specifically, Hippotherapy is the use of the horse’s movement and sensory input for improving function. Licensed Physical and Occupational Therapists properly position the patient on the horse, analyze the patient’s response and direct the horse’s movement to achieve specific patient treatment goals. This strategy can be used effectively to improve a variety of functional areas including balance, posture, mobility, communication and behavior for patients of all ages and many disabilities. The well-trained therapy horse moves in a rhythmic, symmetrical and organized way. Each step the horse takes provides strong sensory and physical input in many dimensions including up and down; side to side; and back and forth. By asking for variations in these movements the therapist gains results that cannot be achieved by a machine or duplicated in a clinic setting. The very capable horses at Ride On have been carefully selected for their movement quality and even temperament and then further trained. The horse accurately and tirelessly provides ample opportunities for the patient to experience movement and sensory input that will enhance the quality of life. Scholarships are available for those in financial need. Please call for more information. 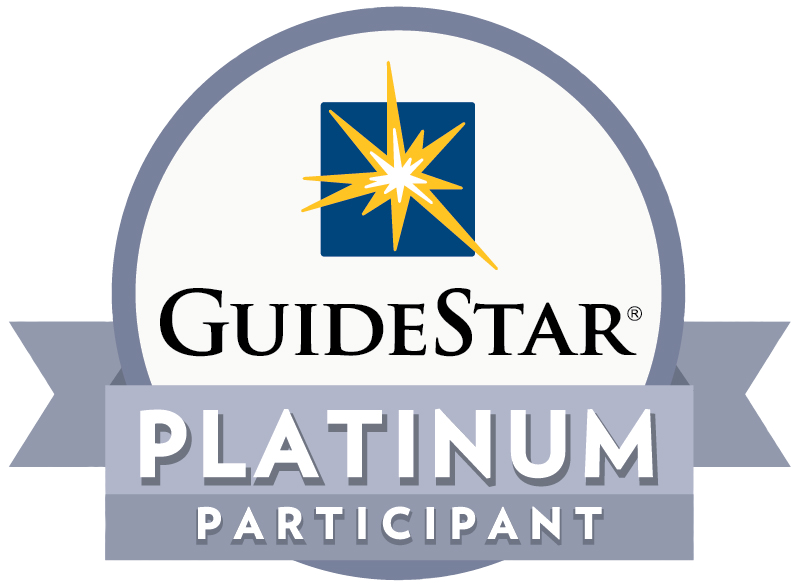 Ride On has offered Equine Assisted Psychotherapy for over ten years. We offer individual sessions as well as working with groups, and require no experience with horses. We focus on ongoing therapy for treatment centers, teenage girls and couples and we also work with school and work groups in teambuilding settings. The treatment team consists of a therapist, an equine specialist and the horse. All activity is unmounted. Horses have an amazing ability to facilitate communication and breakthroughs. Horses have survived for millennia by reading the environment around them. They are expert in sensing nervousness, uncertainty, anger, fear and their reactions are unfiltered and often dramatic – there’s nothing unambiguous about a 1,000 pound animal walking up to nuzzle you or trotting away in reaction to your actions. They honestly reflect what they sense and feel and understand reactions before anyone speaks. They do what horses do naturally, often surprising all of us! The Therapist is present to explore what is happening and identify patterns of behavior. The Equine Specialist monitors the horse’s actions and keeps things safe. The experience in the arena is discussed and applied to daily life. Sessions may end with quiet grooming which relaxes humans and horses alike and a chat about what happened. We currently offer mounted and unmounted programs for Veterans depending on the needs of the service member and all at no cost. We also welcome Veterans and Vet groups to volunteer, giving them an opportunity to learn about horses and help other Veterans and children. Ride On’s un-mounted Equine Facilitated Psychotherapy sessions are designed to help Veterans and their families cope with the psychological and physical effects of service to our country including post-traumatic stress and traumatic brain injury and other issues. 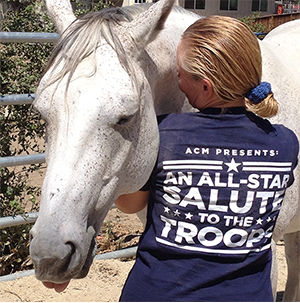 A horse will both reflect and respond to those around them and this unbiased equine observer can help Veterans recognize unhealthy patterns, identify their strengths and enact new behaviors all of which affect their families and their employment. This approach allows Veterans and therapist to see where the problems are and explore solutions that work. Our adaptive riding program is focused on the acquisition of riding skills for those with physical and cognitive disabilities. Here the emphasis is on balance, strength, riding and cognitive skills. Ride On has a robust competition program beginning with local schooling shows and progressing to international competition. 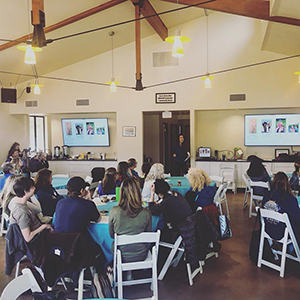 Ride On is a US Equestrian Federation Center of Excellence for Para Dressage and is actively working to help build the next generation of athletes, including veterans, to represent the United States. We are very excited to be able to offer these programs! Many Veterans from Southern California have benefitted from working with our licensed MFCC and Equine Specialist, and of course the horses! Ride On hosts Networking and Education Days. To be Announced! Ride On offers lessons for the siblings of our riders as well as the general public. Our PATH certified instructors and gentle horses are perfect for all those wishing to take beginner or intermediate English or western style lessons. We offer lessons at both Newbury Park and Chatsworth for only $52 for a group lesson (3 or more) for 1 hour. Please call for more information.